Recently, I was lucky enough to receive a copy of Max Brenner’s new book, Chocolate: A Love Story. Having enjoyed visiting one of his shops in New York, I was anxious to try out some recipes. 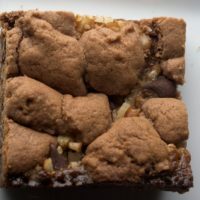 Actually titled “A philosophical highly concentrated fudge brownie,” this chocolate extravagance cried out from the book’s pages to be made as soon as possible. Who am I to argue? I’ve never understood why most brownie recipes are made in a tiny square pan. They’re brownies. Less is definitely not more. I am proud to say that these aren’t made in one of those small pans or even in a 9”x 13” pan. No, they’re made in a nice, big half sheet pan. That, my friends, is how brownies should be made. Take the size of that pan into consideration when you read through the recipe. Don’t panic. Sure, it has two pounds of chocolate (I highly recommend Guittard’s 72% bittersweet chocolate) and a couple of sticks of butter, but the end result is a gigantic pan of brownies destined to make everyone you share them with your new best friend. I took the majority of these to work, where they were thoroughly enjoyed. Be warned that these are very rich – quite the adult brownie. 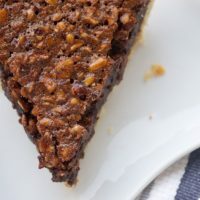 My only alteration to the recipe was using pecans instead of walnuts. First of all, I adore pecans. Secondly, walnuts? Ew. I’m sure there are some of you who have no objection to walnuts, so go right ahead and use them. Or, use hazelnuts or whatever kind of nut you prefer. It is recommended that these be refrigerated overnight before cutting and serving. That definitely helped the firmness of these extra-fudgy brownies and made the cutting much simpler. So, don’t give in to your impatience and eat them as soon as they come out of the oven. I feel confident that this is the first of many recipes I’ll try from this book. There are cakes and cookies and puddings and such that are already bookmarked for future baking. I just so happen to have an extra copy of this book that I would love to send to one of you lovely readers. If you’re interested and live in the U.S., just leave a comment on this post between now and Tuesday, November 10, 10am CST. I’ll pick one of your comments at random and send it your way! Indulge your chocolate craving in a big way with these amazing Fudge Brownies! Preheat oven to 350°. Line a 13″x 18″ jelly-roll pan with parchment paper. Butter and flour the paper. Place chocolate in a large heatproof bowl. Set aside. Place the butter and cream in a saucepan. Over medium, heat bring to a boil. Pour over chocolate and let sit about a minute or until chocolate begins to melt. Stir until chocolate is completely melted and mixture is smooth. Set aside to cool. Add vanilla extract to cooled chocolate mixture. Whisk in eggs, one at a time. 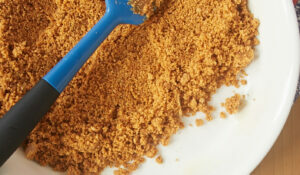 Whisk in sugar. Sift 3/4 cup flour and salt. Using a wooden spoon, stir into chocolate mixture until fully combined. Toss nuts with remaining 1/4 cup flour. Stir into batter. Spread batter in prepared pan. Bake 28-30 minutes, or until a toothpick inserted in the center comes out almost clean. Allow brownies too cool. Wrap and refrigerate overnight before cutting into bars. Recipe slightly adapted from Chocolate: A Love Story. Ooh, pick me please! 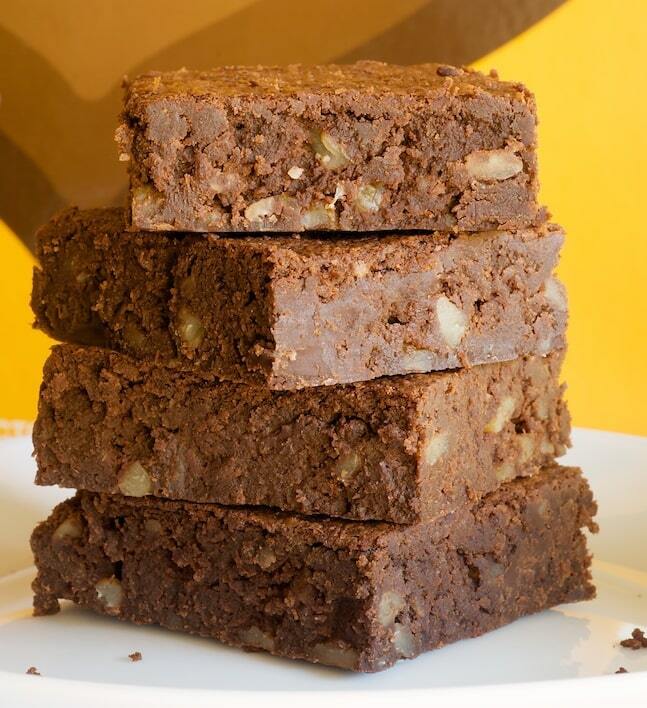 Those brownies would really brighten this rainy day! Those brownies look so yummy. I adore chocolate. It is my true passion so I can’t wait to try this recipe. I completely agree, brownies should never be skimped on. 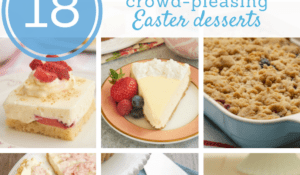 Why bake an 8×8 when you know they’ll be gone before the cook even gets a bite? Thanks for posting this yummilicious photo and thanks for the giveaway! It would be a great early Christmas gift. Oh my! I’m guessing at some point today (b/c there really isn’t enough patience in the world to override the pregnant variety of cravings that would allow me to chill these over night) I will be enjoying a fudge brownie. A big sheet of fudgy bittersweet brownies baked with anything-but-walnuts? It’s like you’ve written this post specifically for me! Seriously, these sound delicious and whether or not I’m lucky enough to win this cookbook, thanks to your description, this is a recipe I’d love to try making next week. (First we’ll have to finish the dark chocolate chip cookies I’m currently baking off from a double batch of dough!) In fact, the whole book sounds rather intriguing and I would love the opportunity to get my hands on a copy. Thanks for the generous offer to give away a book to one lucky reader! yum! pick me – i’m obsessed! Those brownies look spectacular. Believe it or not, I just recently discovered the joy of homemade brownies vs. the box. A new recipe (from a new book) would be divine. Thanks for sharing! I want to make these brownies. I want this book. Actually, I want someone else to use this book to make me these brownies….and maybe a couple of other things out of it! I can’t stomach the nuts (EWW), but I would love everything else! YUM! That’s look great. Yum Yum Yum! I would love to have a date night with those bad boys! Ooh, put my name in the drawing! Those brownies look scrumptious. I would love to win the book!! Those brownies look amazing! Those look amazing! I looove Max Brenner and would love to take a glance through the book. Yummm! I would LOVE to have my very own copy of that cookbook (and a couple brownies)! YUM! Those look deliciously and decadently fudgy. Thanks for the recipe! if the majority of the treats in the book are anything like this, it’s a winner. what an awesome slab o’ chocolate. There couldn’t be a better way to sweeten the day!! Fact one: I LOVE BROWNIES. Fact two:I LOVE PECANS. Fact three: If the two are combined….. there will be no sharing of the deliciousness!!!! Oh wow, those look delicious! I totally would have subbed the pecans instead of walnuts too. Yummy. Oh I would love this cook book! I loved your review about the little Christmas houses pan the other day by the way… and those brownies look amazing! Yummy! A book of Chocolate recipes…I can only imagine! Oh my! those look so lovely. i can’t wait to make them! Those brownies look outrageous! I would love to have the book if everything comes out looking equally delicious. Drool…. those brownies look incredible! The brownies look wonderful! would love the book! There is no way I could refrigerate before tucking into these!! But then, I would probably have eaten a great quantity of the batter before it was even put in the pan! Wow, just wow… They look so yummy! 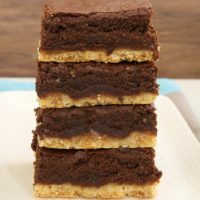 I would love to make these… Baking brownies is my favorite thing in the world and it would be great if I could add this to my book of recipes. Oh! and as soon as I can and have a little time I’ll try to make these :):) So excited!!! I’m with Jennifer, I don’t think I could wait to eat them…but yes, I too would be eating a lot of the batter. Shame on us! I bet these are delicious. Good God those look delicous! I don’t think I could ever wait overnight before I could cut into them. that many brownies would be dangerous in my apt!! Wow! Those brownies look amazing! It always brightens my day to see that you have posted a new recipe! And as always, you have chosen something that looks beautiful AND delicious… Something I absolutely cannot wait to try out! Also, I’m running out to the store to buy that lovely cookbook ASAP! The brownies look wonderful, and the book sounds amazing! These look wonderful. All your post always look so good! I am always excited to see a new post. Thanks for the wonderful recipe’s! Yum! They look great! Other than from a mix the only other recipe I have tried is from the Barefoot Contessa and these look as if they certainly are in the same league. I think I will have to make these for my coworkers. They look delish! Pick me!!! Hand waving. Pick me!!! Those brownies look amazing. A must try. Wow! Those brownies look delicious, and the book sounds great! OMG, these would be absolutely perfect for my english department’s fundraising bakesales!! Please, please, PLEASE pick me, and support a starving english major! me love love love pecans. Oh, if I don’t win, I’ll have to go out and buy the book – I am a HUGE brownie lover, well, all things chocolate, anyways. Those look simply mah-ve-lous! I have had trouble finding a good recipe from scratch–too hard, too dry etc. 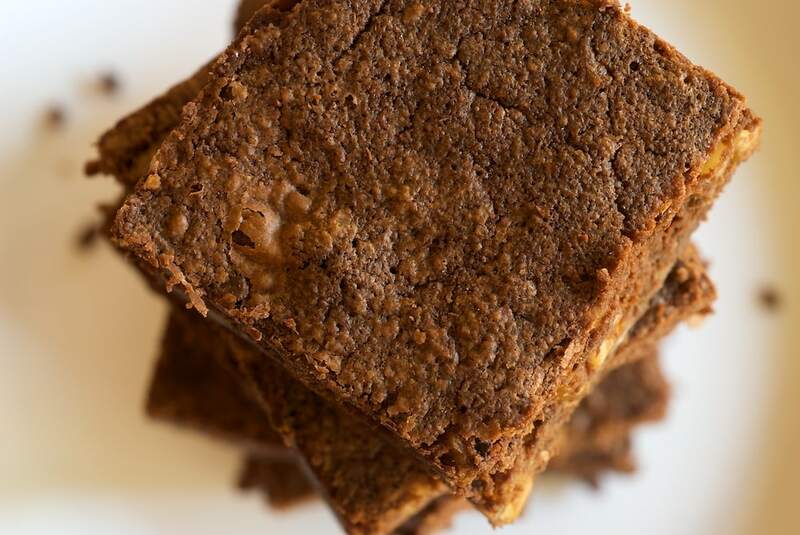 Your photos captured the moistness in these brownies….can’t wait to try them. Also, i love too to make a sheet pan of brownies. Thanks. I am inspired by your posts. The brownies look and sound delish! I adore all things chocolate 🙂 Would love to get my hands on this book! Chocolate: A Love Story — sounds like my life!! Great write-up and photo, as always. What a great title for a book! and those brownies look spectacular. Thanks for sharing ! I love chocolate! That is all. These look so incredibly rich- just as a brownie should be! Those brownies look perfect! Hard not to lick the screen. Thanks for the giveaway! A full sheet of brownies would brighten any day. Brownies are the 6th food group at our house! These look great! Thanks for the book giveaway! Well, cover me in chocolate..these bad boys look wonderful Jen. You do know it’s not nice to temp chocoholics? I would be very much interested in seeing what Mr. Max has to offer in his private collection? Funny I find it rather interesting how recipe books are written as most are tweaked today which makes me wonder for convenience why don’t they just provide or include a scale down version of each recipe. 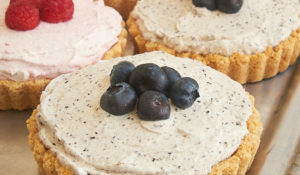 Thus you can make 1/2 dozen items or more to test, taste and tweak as desired without having to waist Ingredients & time trying to work out and customize a desired product. Also because I’m easily tempted think I would rather have 1/2 dozen or less laying around the kitchen than 2 dozen tempting treats calling my name in the middle of the night along with a nice big glass of milk. So fudgy. Just my kind of brownies. i agree! sometime’s it’s nice to mix up the nuts in brownies. After making Ina’s for years, I’m ready for a new “huge pan of brownies” recipe. They look luscious! I’d love to have a copy of the book for the brownie recipe alone! OH! Those do look yummy. I try to mix it up and test out new brownie recipes every other month or so…looks like these will be in the next taste test! Always in search of a better and BIGGER brownie recipe. And I’m definitely with you in the pecan camp. Walnut – ew. I enjoy your blog and would love to have this book. Yum, those look so tasty. I’m a pecan fan too. The last brownies I made were from a mix. I promised the kids the next batch would be from scratch! Those look extra yummy and moist. oh, my. Those look absolutely delicious! Max Brenner is amazing and I didn’t even know he had a book out. I would absolutely love to win this book. 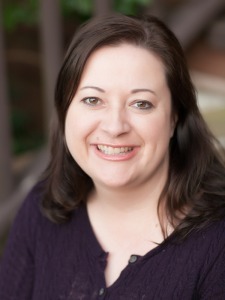 Your blog is also truly awesome. I love what you write and your photographs are great. Ooohhh.. a half-sheet of brownies, that’s just right! I’ll have to try them side by side with the Ina Garten’s Outrageous Brownies. An adult brownie is something I could love. I have never seen a brownie recipe with cream! What’s not to love! I’m a pecan fan is well. Perhaps it’s my Texas roots! omg i want this book so badly! I am always looking for the perfect brownie. This may be the one! I have never been fortunate to visit Max Brenner’s but all the treats I make have some chocolate components so I would LOVE to win his book! Thanks for a great blog- keep up the good work! Can’t wait to try the brownies and hopefully a few more recipes when I win! Hhmmm I had never thought about baking brownies in a huge pan before – what a great idea! They look delicious, and I can’t wait to bake them. Those look incredible. The only problem with a half-sheet pan of brownies is that I would probably eat the whole pan myself. I adore brownies. P.S. I usually don’t comment unless I have tried the recipe, but I want that book! 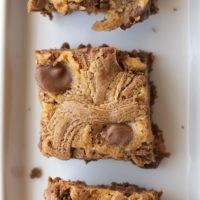 I’ve never had good luck with brownies, they almost always stick to the plan but I am definentally going to try these because they dont bake in a typical brownie pan!! I visit your blog to drool every so often. Sadly I rarely get sugar or treats but when I do…..they are Bake/Break worthy. These look wonderful! Would love to see what cakes are in the book too. aylin, I’ve tried many chocolates, but I just like the taste of Guittard. It’s a personal preference, I suppose. The best advise I can give you is just to try different ones until you find what you like. Then, try some more! I love trying out different brands. You never know when you’ll find something fabulous. These brownies sound divine. Can’t wait to try them! I love fudgy brownies! I haven’t made them in a while so I might actually make these soon. Those look awesome. I don’t think I do the overnight waiting though! This would be an awesome book for holiday treats! OOh pick me!! Sounds amazing, and delicious!! I’ve been looking for the perfect brownie recipe for my holiday gift baskets… definitely think I just found it. Thanks! Um….shyeah!! memememememe ME ME ME! I love brownies, but I will admit that I’ve never made THAT many at once! However, one can never have enough dessert! Oh sweet baby Jesus. These look fantastic! Always love seeing what recipes come out of your kitchen. Brownies! Don’t know if I’d have the willpower to give them away. I too would love to win. I love the shop and would love to try my hand at the recipes. Yay more brownies! I have you to credit for starting to make brownies from scratch! 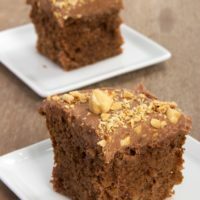 My husband is a huge fan of the dense fudgy brownies, so he’d love these. Sounds wonderful! I might have to make these for our playgroup gathering this week! Yum! These look great! Thank you! Oh my are these ever calling my name! I’d love to sink my teeth into one (or four) of those! Those look fabulous! I may be making them this weekend!!! And the winner is… Lili! This fun, yummy book will be on its way to you soon. Congratulations! 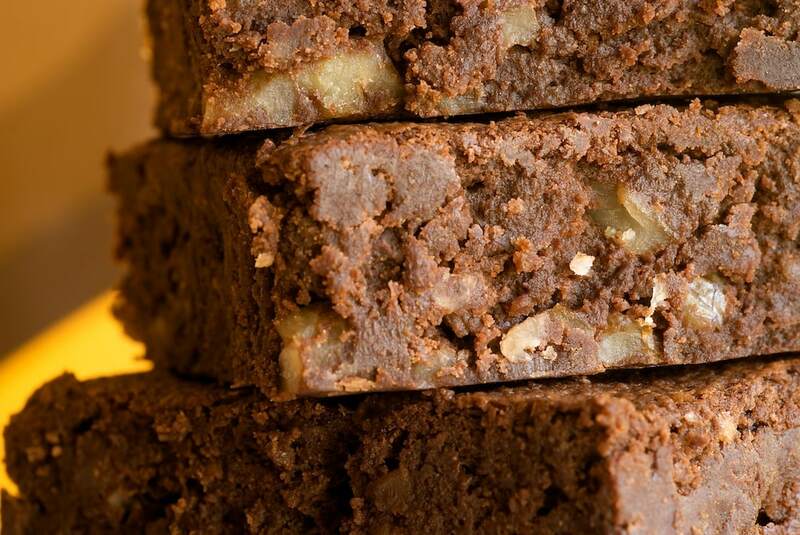 These sound like they’d be the perfect brownie to crumble over vanilla ice cream…yummmy! If there is a Whole Foods in San Francisco, they sell chocolate in 8 oz.bars and sometimes they are larger. Much better than 4 oz. bars and I would imagine there must be other markets selling the larger sized bars of chocolate – they are not marked “baking chocolate” but are semi-sweet, bitter-sweet and even unsweetened. Now to find a copy of Max Brenner’s book and try the brownies – truth to tell I will only bake half a recipe which should be just fine for this brownie-freak. I just found this site by googling Adult Brownies and I am so happy to have found it. Sounds very interesting to this NYC exile in NC. Valerie, of those you mentioned, I’d recommend Ghirardelli, but any dark chocolate should do. You can get Guittard chocolate at World Market. Someone has told me they buy it at Sam’s, but I never have. You can also buy it directly from Guittard as well as some other online places. Just Google it! I could not agree more with your opinion of a small pan of brownies, say 8×8 or 9×9, I always, always double that kind of recipe. We at the Palmer household almost never make a single batch of anything, even if we have never tried the recipe before, I suspect this would be the exception. I tried these the other day and they were fantastic. I’m from Sydney, Australia and we have Max Brenner’s everywhere, but I didn’t know he had a book out! Jennifer, I made a batch of these last night for our Ole Miss tailgate today. I just finished cutting them into squares and of course, had to try one…for breakfast, y’know! I used walnuts, because Jeff doesn’t like pecans (yes, I don’t know how that happened, him being a southern boy and all) and thought the walnuts were pretty good. I think I’ll make another batch closer to Christmas and use pecans. As for chocolate, since I didn’t have time for a trip to Tupelo, I used Hageland’s Belgian dark chocolate, which our Walmart Supercenter carries in 14 ounce blocks. This is only a 53% dark chocolate, but I thought it turned out good. These brownies look great!! YOu’re right, brownies must be made in larger pans!! Oh my! These are perfect! I love brownies..and these brownies looks so delicious! Yum, yum, yum! No se hablar en Inglés. 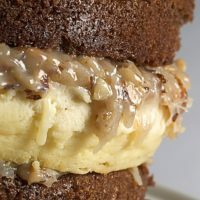 Te puedo decir en mi idioma que tus recetas son deliciosas y que me encanta tu blog. Un saludo desde España. These brownies are right up my alley. I Love fudgy brownies! I will have to test these out and maybe start making my regular brownies in my half sheet pan! What gorgeous looking brownies! I would love to try them and I’m with you on the ew to walnuts! I say this every time I see brownies, but my wife LOVES them, so I really have to get cracking if I want to be in her good books for Xmas! I think it’s time to have a new posting. Max’s brownies are now 6 weeks old! 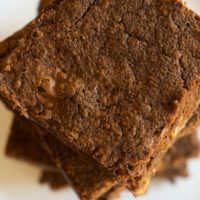 if this recipe has been on here 6 weeks, i may not get a response, but i have tried the max brenner brownies twice now and though they are sooooooooo delicious, I am continuing to have problems with them crumbling…what am i doing wrong?? ?any help or advice would be appreciated!! after making Max Brenner’s brownies and having them tasted by a half a dozen people, including choco and brownie philes, it was concluded that this is a recipe gone awry. The taste was not pleasing! It left a long aftertaste of chocolate in your mouth that on the surface sounds like a good thing but actually was concluded not to be. This primary criticism does not address the expense of 32oz of good chocolate or the time to chop up said chocolate.I’m sorry my husband talked me into baking them. Where do you buy Guittard’s chocolate. I have never heard of that brand. Sarah, I know World Market carries Guittard. Someone told me that Sam’s does, but I don’t know. You can also order it through them at guittard.com. aw man- i think i might make these this weekend! Very generous of you to give away such an awesome cookbook! i would be honored to take it off your hands! I am a cookbook fiend! Good shots of the brownies. Yummy! Jennifer, if you happen to see this post, I have a quick question. I see you recommend Guittard bittersweet, but what do YOU use when a recipe calls for unsweetened baking chocolate? I checked Guittard and see they don’t offer that. I’ve not been entirely satisfied with the quality of anything I’ve tried thus far. Since I’ve been reading your blog for several years, I believe your affinity for chocolate either matches or surpasses mine, and that’s saying something…so I know you’re the one to ask. Jennifer, I usually use Ghirardelli, mostly because that’s all I have available locally. I would love to try some other kinds. Let me know if you find one that you like. I made these last week and they were THE BEST fudge brownies I have ever had. And the amount that this recipe generates is jaw-dropping. Plus, it’s fun to make. Looking at that pile of just-chopped chocolate and KNOWING THAT IT’S ALL HEADED TO YOUR STOMACH is almost too much to handle. Oh, the torture of waiting for these to be done. Thanks for the post. I had to go buy a new belt because of you. Amy, Williams Sonoma carries some Guittard, and so does World Market. You can also order it online. I like chocosphere.com. I baked these today and must say they are totally amazing…but SO rich. A small bite is all you really need to nix a sweet tooth. I don’t even want to know how fattening these are because I think there is a good change I ate way to many today!!! These are really great looking brownies. Jennifer, you come up with the best recipes! Your posts are simple and easy to digest. These “adult” brownies look amazing. Great recipe for my office! I will be making these soon! I hope you like them, Mindy!